Mads Mikkelsen, as Le Chiffre, wears a Longines Evidenza Chronograph, steel bracelet, black dial, black subdials and Arabic numerals in the Bond movie Casino Royale. The watch can be seen during the thrilling poker game in the film, most clearly in Chapter 20 of the dvd. 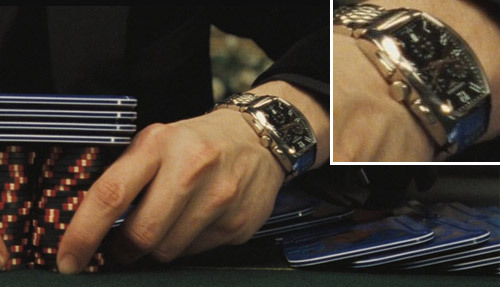 Most players at the poker table wear Omega, the brand that provides James Bond with his watches since 1995, but Bond villain Le Chiffre wears this Longines, maybe because Omega doens't want the bad guys don't wear their watches. 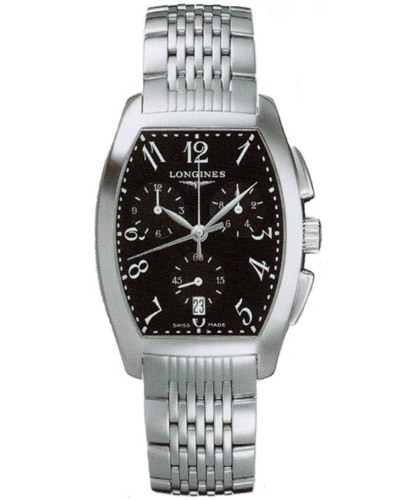 The Longines Evidenza as seen in the movie has a steel bracelet, three black subdials and Arabic numerals, modelnumber L26564536.